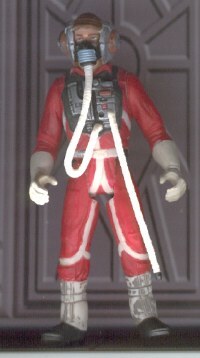 The B-Wing Pilot was made from the body of Ten Numb and the head of an Ep. 1 Obi-Wan figure. I boil and popped the head of Ten Numb (which was used on my alien X-Wing Pilot). I painted the flightsuit red. Once the paint dried I painted several coats of Testor's dull coat on the body. I then glued Obi-Wan's head to the body. I wanted to make a removable helmet, but it just wasn't working; so I cut some pieces away from the helmet so that it would fit Obi-Wan's head and glued it in place. When this figure is stood next to another figure, it is extremely short. Ten Numb's head makes up for a lot of heighth.